Miami-based chef and restaurateur Michael Schwartz shares his passion for where food comes from at The Genuine Hospitality Group. Since his flagship, Michael’s Genuine® Food & Drink, first opened in Miami’s Design District in 2007, diners have come to embrace and crave its refreshing combination of laid-back atmosphere and seriously good food, a neighborhood bistro that is the ultimate showcase for the type of cuisine that Schwartz does best – homemade and straightforward, with an emphasis on fresh, local ingredients. I was 15 and my dad wanted me to get a job! I grew up in Philadelphia in the 60s and 70s. The closest I came to cooking was cutting up the Stroehmann white bread for stuffing at Thanksgiving dinner. Mom didn't make much from scratch so I really had my first experience getting excited about food at a restaurant. I started in the front of house bussing tables at this place called Dilullo's, a Northern Italian restaurant that was really ahead of its time back then. They were importing expensive, high quality ingredients from Italy, things I hadn't seen before. After a year, I had worked my way to where I really wanted to be, in the back of house! Tell us about The Genuine Hospitality Group. What inspired the idea and what is your vision for the company? Well I've been cooking for more than 30 years now, did a lot of traveling and worked in kitchens on the east and west coast of the States. Working in California in the 80s especially opened up my eyes to a fresh, simple, pure approach to food and drink, the principle on which we opened Michael's Genuine Food & Drink, our flagship, and that informs everything we do. Alice Waters was a major influence early on. She really (re)introduced the concept of slow food into contemporary cuisine and showed us the power that freshness of ingredients has over the quality of the dish. Alice made it ok to serve a bowl of peaches barely garnished as long as the peaches themselves were perfect. It's hard to believe now with "local" as the buzzword in the food world, but it was kind of subversive for that time. What strategic partnerships/marketing strategies have you implemented that have attributed to The Genuine Hospitality Group's success? Our success largely depends on our sources so I'd have to say our farmers and the people growing and raising the ingredients are a good starting point. Without them, the product wouldn't be great and neither would we. By supporting these small operations we also guarantee the good stuff will keep coming. As we've grown we've also been lucky to attract partners like Royal Caribbean who see what we do and want to learn and innovate how they operate. In turn we've learned a lot about bringing what we do to scale - what works and what doesn't - and the team is stronger and smarter in how we operate on land. We now are in the middle of opening the second of three Michael's Genuine Pubs on the new Quantum Class. If you told me in 2007 we'd be working on cruise ships, I'm certain I would have laughed in your face! At the end of the day it's really about what we like to do and have fun doing. We try not to be too consumed by what's "trending." Success for us really has so much to do with what resonates locally. We always enjoy eating out on the road, seeing what's on menus, what new product is out there and how it is being utilized in the kitchen and at the bar. Your greatest success as Proprietor of The Genuine Hospitality Group? Most difficult moment-how did you overcome and what did you learn? Attracting great people and cultivating talent. A few years ago I would probably have said getting out of the kitchen and coping with that transition. How it affected the restaurant, how it affected me as a chef. Embracing the new role of restaurant group owner and how to let go, but also that the restaurant would be ok. We learned the importance of cultivating the Genuine culture and empowering the staff to embrace the fresh, simple, pure philosophy. Now I'd say every decision we make as we grow is a most difficult moment! But they need to be in order to take the company in the right direction for the best future. Trust your instincts and your people. Being afraid to make a mistake is ok. Challenges and realities inspire the best kind of creativity. Being practical has always served me well. Describe the ideal experience at a The Genuine Hospitality Group restaurant. Our restaurants are all about zero pretense and maximum hospitality. Great food in good company. Food should be comfortable and feel familiar. How important are architecture/design to the success of The Genuine Hospitality Group venues? The spaces are key. It all needs to work. We are very involved in that part of making restaurants. They go hand in hand. Our Crispy Hominy with chile & lime might be the snack that put us on the map. It satisfies all my cravings at once -- crispy, crunchy, and the squeeze of lime to cut through it all. It's so addictive! Stracciatella with heirloom tomatoes, fresh basil, extra-virgin olive oil, fleur de sel is probably the most meaningful dish. This is Michael's Genuine on a plate. Just a few ingredients, each at their peak! We have a food bar in front of the wood oven in our open kitchen, and it's always lined with ingredients in season. Tomatoes are so iconic for us in the South Florida winter. Really synonymous with the restaurant. After 7+ years, we decided to expand our bar and add afternoon service in between lunch and dinner. 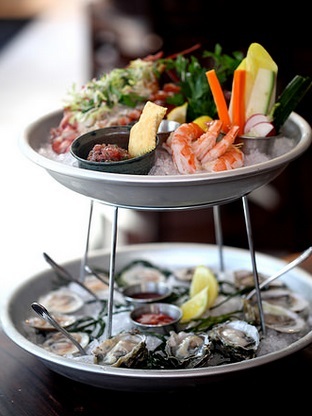 We have this great raw bar now, front and center when you walk into the restaurant. We offer a daily changing ceviche, crudo and tartare, shrimp cocktail, Florida stone crabs when they're in season, and oysters from the East and West coasts. The plateau is a two tiered selection of everything! Besides hominy, there may be no better welcome to Michael's Genuine! That gets harder and harder as we grow. It starts from the top down. Having a presence at the restaurant, sharing the bigger picture of what we do but also the importance of taking pride in one's responsibilities and ownership of that is really important. Danny Meyer wrote the book on hospitality. It's inspiring to see someone bring this to life in one special restaurant, plant that seed, and be able to succeed in it years later on much larger scale. My wife. She makes me a better person and healthier person! Our family is the most important thing in my life. It's a family business through and through. What's next for The Genuine Hospitality Group? We have some projects slated through 2017, including the third Michael’s Genuine Pub opening on Royal Caribbean's Quantum Class and Harry’s Pizzeria will be opening in Coconut Grove, our second location in South Florida. We have a restaurant and beach club at Related Group's Paraiso Bay development in Miami's Edgewater neighborhood and a restaurant at SLS Luxe Brickell in Miami. Lots going on, just trying to keep up! The Genuine Hospitality Group operates restaurants including Michael’s Genuine® Food & Drink (Miami Design District Est. 2006 and Grand Cayman Est. 2010), Harry’s Pizzeria® (Miami Design District Est. 2011 and Coconut Grove 2015), 150 Central Park by Chef Michael Schwartz aboard Royal Caribbean’s Oasis Class ships (Oasis of the Seas Est. 2011 and Allure of the Seas Est. 2013,) The Cypress Room (Est. 2013), and Michael’s Genuine® Pub on Royal Caribbean’s Quantum Class ships (Est. 2014, 2015, 2016) as well as food and beverage at South Beach’s iconic Raleigh Hotel including Restaurant Michael Schwartz (Est. 2013.) Michael’s Genuine® Home Brew is a classic American Ale craft-brewed in Gadsden, Alabama with Florida-grown brown rice and sugarcane, sold in the chef's restaurants and with on- and off-premise retail distribution throughout the state of Florida. The chef’s cookbook, MICHAEL’S GENUINE FOOD: Down-to-Earth Cooking for People Who Love to Eat (Clarkson Potter Publishers, 2011) features beloved recipes from his flagship, an homage to approachable, sensible, and affordable food that everyone loves to make and eat. His recipes and restaurants have been covered by the New York Times, Wall Street Journal, Food & Wine, Travel + Leisure, TODAY Show, and more. 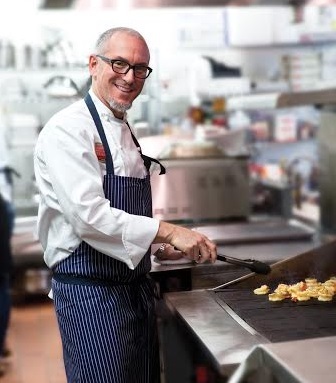 Schwartz began his career in Philadelphia, and earned his culinary chops in kitchens from Los Angeles to New York City, until settling in Miami in the early 1990s. He currently resides in Miami Beach, FL with his wife Tamara and three children, Ella, Lulu, and Harry.